PHOENIX – A US 191 bridge about 7 miles north of the entrance to the Morenci Mine has reopened after work by the mine’s contractor to stabilize earth around an abutment. In consultation with Freeport-McMoRan and its contracted engineers, the Arizona Department of Transportation determined the Coronado Bridge is safe for traffic while long-term repairs continue. Brief delays are possible. 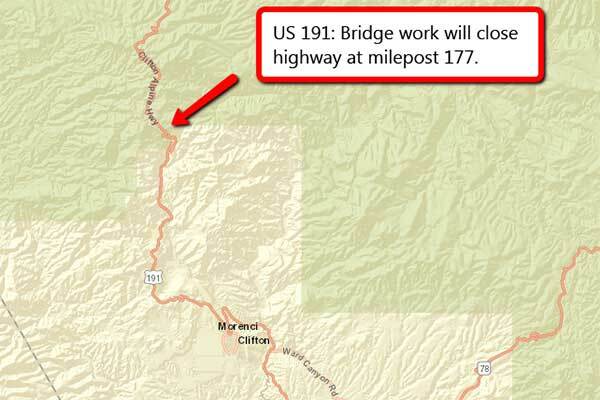 The bridge, near milepost 177, closed Feb. 28, requiring those traveling between Morenci and Alpine to detour through western New Mexico. It was built in partnership with Freeport-McMoran, which operates the Morenci Mine. According to Stacey Koon, General Manager-Administration Freeport-McMoRan Morenci Operations, the company was able to expedite work to reinforce the bridge abutment by redirecting internal resources.